Sports fans can be a diehard bunch whether its the potential of arrest just for wearing a Manchester United jersey in Malaysia or selling blood in order to get tickets to the Green Bay Packer games or stomping a message like the one above to your rival in the snow. The slam against the luckless Cubs was created by rival Cardinals fans outside Busch Stadium. 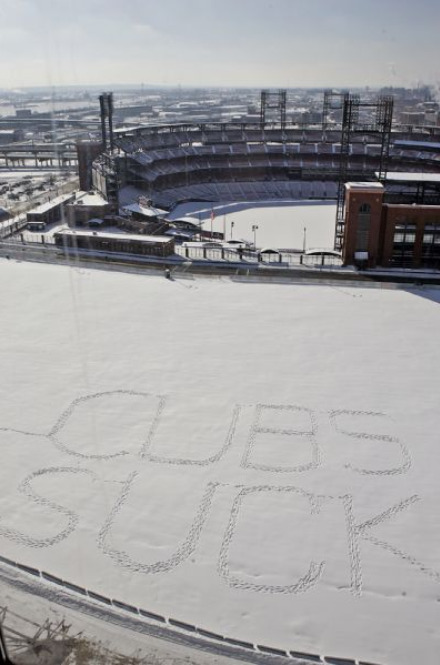 Snow at the St. Louis stadium resulted in another memorable moment for Cards fans last week. Lifelong Redbird fans Kurt Benhoff and Christina Ferrell, who now live in Kansas City (sorry Royals fans), scheduled their dream wedding at home plate in Busch Stadium. Unfortunately Mother Nature threw them a curve, providing her own version of a white wedding. Unseasonable blizzard-like conditions had the wedding party braving snow flakes along with their wedding day jitters. Offered the opportunity to move the ceremony indoors, the couple opted to stand tall in the batter’s box for their first swing at matrimony. Maybe they should have combined their baseball wedding with a Shrek wedding to get the green they expected from the grass of the infield. The newly wed couple plans to be back in the stadium this afternoon for their favorite team’s Opening Day game against the San Diego Padres. In recent years, Major League Baseball has scheduled an opening series for two West Coast teams in baseball-crazy Japan. With the recent earthquake, tsunami and ensuing nuclear disasters there, I’m guessing the brass at MLB are glad they avoided lots of headaches by not having the A’s and Mariners playing in the Land of the Rising Sun this season. So for all you baseball fans out there, enjoy the unofficial national holiday that is Opening Day.